GRAFENWOEHR, Germany — The first day of school is just one day away and there are some important things to keep in mind for children and their parents riding a school bus this year. Ensure children know and use the safest route possible to and from the bus stop. Teach children how to safely cross the street and use pedestrian crosswalks and traffic-lighted intersections. 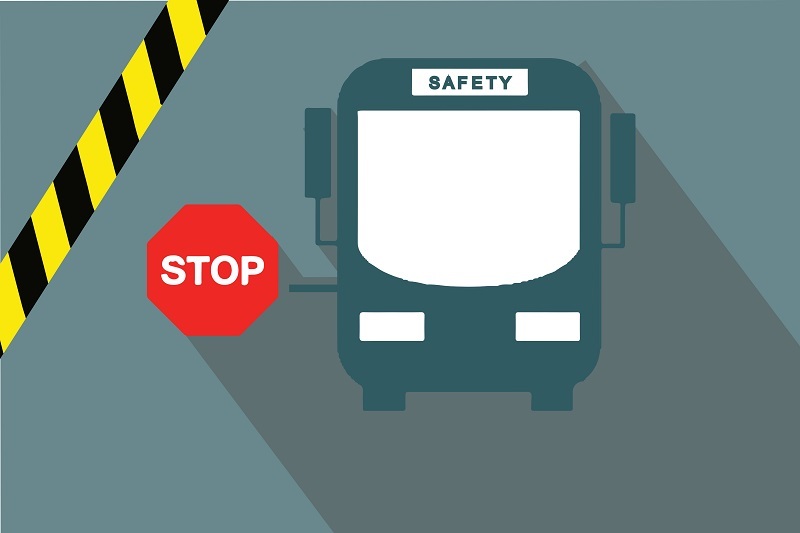 Students must present their bus pass to the driver while boarding the bus. Ensure children wear clothing that is easily visible to motorists. You greatly improve your children’s visibility when you put reflective tape or devices on your children’s outerwear, book bags or other carried items. Be on time – walk, do not run to the bus stop. When waiting for the bus, take at least three large steps away from the curb. Take your seat on the bus and stay in it while the bus is moving. If there are seat belts, buckle up. When getting off the bus, take three large step away from the curb and wait for the bus to leave before crossing the street. Never cross the street in front of, or behind, the bus. Educate your child on the danger zones as shown on the image below. We ask that you and your children take extra precautions when near a school bus. 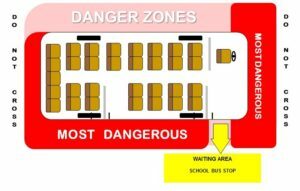 Educate your child on the danger zones around the school bus. Teach them to never cross in front or, or behind, a school bus. Reinforce to your child that traffic in Europe does not stop for loading and unloading of school buses. Stress good behavior on the bus – good behavior and safety go hand-in-hand. On or around buses, student must conduct themselves in accordance with the following school bus rules. Obey the driver or adult. Enter and exit the bus safely, and always show your bus pass. Stay properly seated and use seat belts when available. Keep your hands, feet and other body parts to yourself. Put nothing out the window. Remain quiet and do not disturb the driver or others. No profanity, indecency, smoking, prohibited items or vandalism. Do not eat, drink or chew gum. Be responsible and be safe. When meeting your child at the bus stop, please take charge of the situation. As the adult, you can reduce risk to your child. DO wait on the same side of the street as the bus stop. DO go to your child at the bus stop. DON’T wait in a parked car or in a building. DON’T wait across the street from the bus stop. DON’T allow your child to come to you. DON’T board the bus without proper authority (only registered students, bus driver, security attendant and school officials are authorized to board a school bus).